Edward G. Nilges, “Study for Peter’s Knuckleheaded Flibbertigibet Crazy Aunt”, pencil and pen with Gimp colorization, 2 Nov 2010. 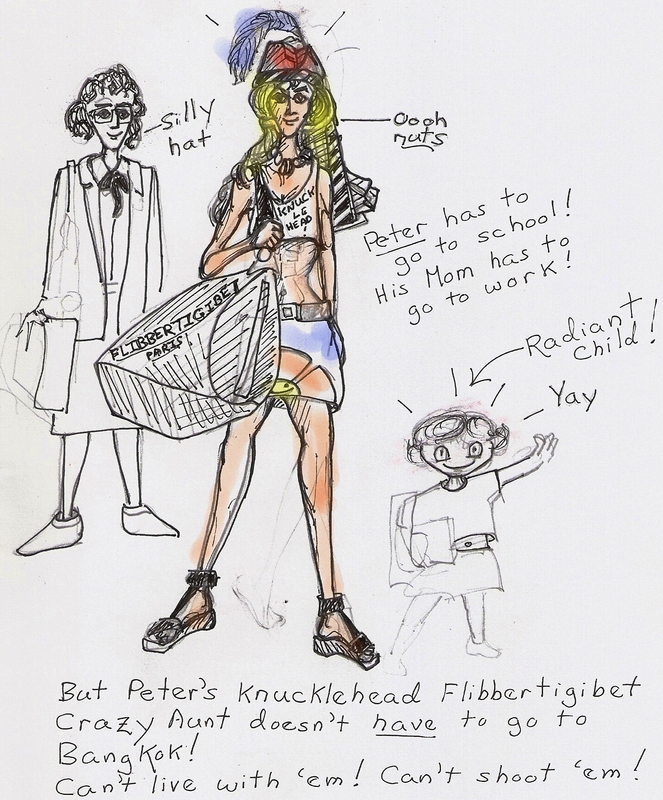 Peter’s Knucklehead Flibbertigibet Crazy Auntie!! And her necessarily sensible Sister, who keeps the cards that read have mercy on her soul. With three different major languages and no provisions for ADHD. There’s a rather offensive poster for a play in the MTR in Hong Kong. A fully dressed Mama is pursuing a baby with his bottle in diapers and a husband with his beer in underpants. This poster says it’s “natural” for blokes to regress while also pretending to be critical and superior to blokes. But blokes, to perhaps a greater extent than women, are confronted in meaningless but well-paid blokey jobs (financial analyst, banker, financial journalist) with “contingency” pushed to the point of absurdity, more so on average than women who tend on balance to gravitate towards slightly more meaningful work, or who, in blokey and contingent positions seem to try and succeed in creating islands of meaning. Blokes are in my view corralled by a society which no longer needs them to climb ship masts nor stand to at Quatre Bras into jobs whose real *telos* is social control; in my direct experience, much of what passes for software development is welfare for white males, in which nothing ever gets done. Which creates infantilization, my response to early on (circa 1981) was transformation and escape, a by no means highly successful strategy. But at least my elder son got in touch with me after seeing that movie American Beauty. He is good. The (Zizekian) obscenity is that I don’t even want to be their Uncle if I cannot be their Father. Uncles are scarey, especially if they are Uncle Fun. The counseling, advisory and consoling spirit can be of your gender or not, part of his or her counsel, his-her advice, and his-her consolation is that in Heaven, sexual difference persists but as comedy. 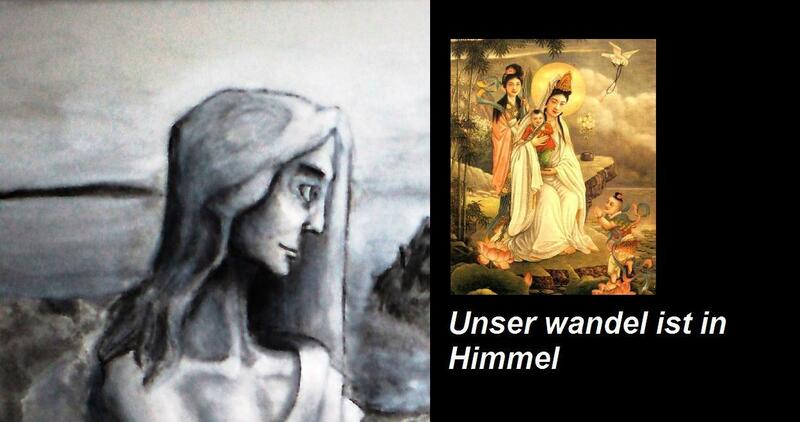 Edward G. Nilges, “Our Conversation is in Heaven”, detail of the grisaille state of a painting (To the Unknown Helper) as of 24 July 2010 assembled using Paint with an old Chinese print of Guan-Yin, 观音菩萨, Boddhisatva of Mercy, who observes the crying of the world (Der Trinkliede der Jammer der Erde) with calm-attentiveness and unperturbed-concern. This entry was posted on November 2, 2010 at 5:29 am and is filed under Uncategorized with tags Guan-Yin, original art, original poetry, Peter's Crazy Aunt, sexuality, To the Unknown Helper, Uncle Fun, Zizek. You can follow any responses to this entry through the RSS 2.0 feed. You can leave a response, or trackback from your own site.